Are affordable iPod workouts the solution to getting in shape and losing weight in these tough economic times? I think so. It isn’t groundbreaking news that the people in best health are also those with the resources to achieve such goals. For instance, according to the International Health, Racquet and Sportsclub Association (IHRSA), the average health club member had a household income of $82,900 in 2005, while those with household incomes in excess of $100,000 accounted for 33% of all health club members. When you consider that personal training is the program offered by health clubs with the greatest net operating revenue, and that only a small percentage of a club’s members can even afford hiring a trainer, there exists a large untapped market that still needs the coaching and motivation that a personal trainer can provide. Having worked with thousands of personal clients myself, I've had to turn away people simply because they could not afford hiring me (or anyone else) as their personal trainer. But imagine the possibility of being able to have your own trainer wherever and whenever you want without breaking the bank to hire one! Pretty cool idea if you ask me. After all, we all need a coach to push us to our full potential. Whether you are Tiger Woods or a couch potato, you need structure, accountability, and motivation to hit your fitness and weight loss goals. The fitness industry has recently witnessed a new movement – the iPod workout revolution. I like to think that my Fitter U and Treadmill Trainer mp3 workouts were at the forefront of this movement. They were definitely the first of their kind in Canada and have now received international acclaim! Beginning about 5 years ago, those who have been using MP3 guided workouts have benefited from having a trainer on their MP3 player providing them with expert auditory fitness instruction and motivation through their headphones. MP3 workouts offer you many of the same benefits of working with your own personal trainer and at a much more affordable price. These “techno” workouts can also offer you the convenience, portability, motivation, education, accountability, and structure necessary to meet your fitness goals. In my mind, they are an invaluable option for you if you travel, cannot afford personal training, want time-efficient workouts to complement your existing training regime, or don’t feel comfortable working with a one-on-one trainer. And, when you consider the popularity of MP3 players, their potential and easy of use is astounding. Since its release in 2001, Apple has sold more than 42 million iPods, with 32 million of those being sold in 2005 alone! According to a study done by Ipsos Research in 2006, 20% percent of Canadians own an iPod™ or MP3 player while 55% of those living in urban cities using their MP3 players while they exercise. Isn’t it rare these days to see exercisers who are not plugged into their MP3 players? Do you have an iPod or mp3 player? If you do, then why not get plugged into my mp3 workouts? To be honest, iPod workouts will never truly replace the one-on-one personal training experience. However, they are the next best option for most people. These workouts are great to use when you are not working with a trainer (if at all) and still provide the proper structure and motivation to achieve your goals. Further, considering their low cost, MP3 workouts can be a viable fitness tool for anyone - regardless of thier income level. And that's why I developed my iPod workout programs. I realized that not everyone can afford to hire a trainer, yet everyone needs one. Well, you now have a solid solution at much more affordable price. For example, my Fitter U workout programs consists of 3 months of audio workouts where I coach you over your headphones. In total, you get 35 hours of personal training sessions that you can do at home, in the gym, or while you travel! The best part is that buying a latte a day at Starbucks for one month would be much more expensive! So why not put the excuses aside and get started by taking my Fitter U workouts for a test drive? Simply fill in the form below and you'll get to enjoy a full 45-minute iPod workout from the 12-week program. Experience the difference expert fitness coaching and motivation brings to your workouts! Download Your Exclusive FREE Report and FREE Workout! 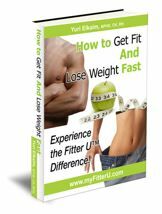 Simply enter your name and email address below and I will immediately send you a FREE copy of my brand new report about the 4 principles that will help you get fit and lose weight fast. I will also send you a FREE 45-minute iPod workout from my 12-week Fitter U workout program. You will also receive a FREE subscription to my bi-weekly Liv Well email newsletter containing free tips to maximize your metabolism, gain muscle, lose weight, eat well, and achieve success in your workouts and your life. All these gifts are yours free as a thank you for visiting my website. Your name and email will never be shared!